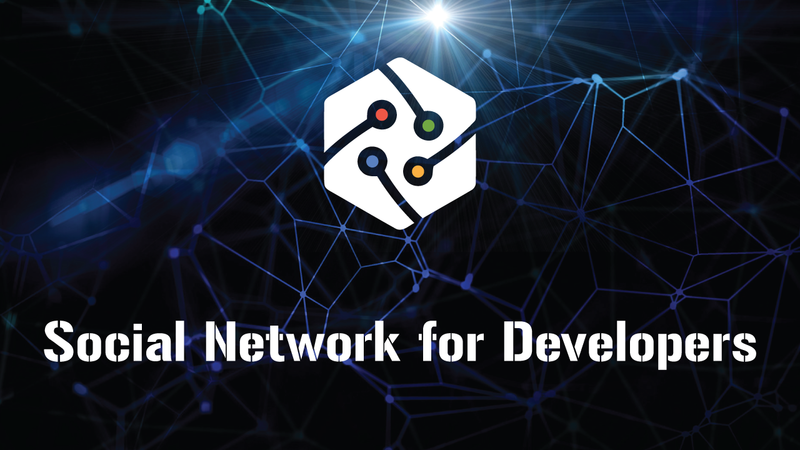 Being a developer, you can manage the same language for both client-side and server-side scripting, and this has brought huge adoption and use of Node. Node.js frameworks are getting huge demand in the market and 2019 is bringing a lot more features and advantages. There are so many top programming languages available in the market but the best Node.js Frameworks of 2019have drastically changed the development process. The use of Node.js frameworks is growing because they have tremendous functionalities like the best productivity, high speeds, and scalability. All these features make Node.js the first choice for developing enterprise level applications for huge companies. Node.js allows you to use the same language for both the front-end and backend. This saves you from the stress of learning new languages and implementing them for running the whole code structure and program. With the help of Node.js frameworks, you can use different tools, refer to different guidelines and also you can recommend practices that will ultimately save you a lot of time. With such an approach, you can become a pro in the coding field. Let’s have a look at the top Node.js frameworks that will shine in 2019 and the upcoming years. 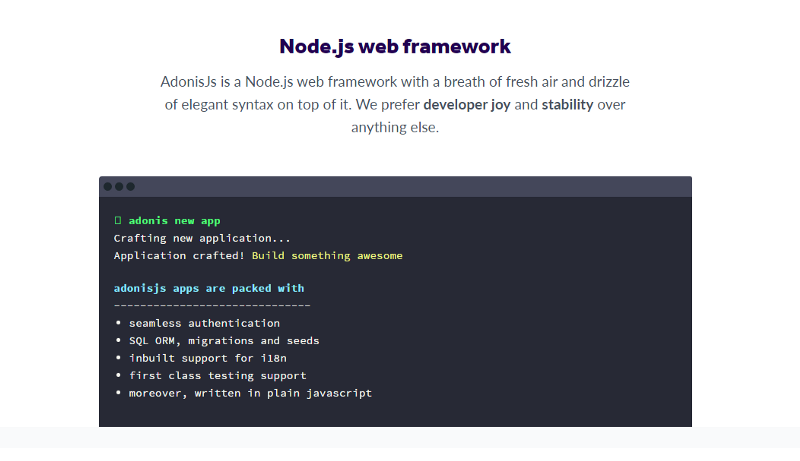 AdonisJs is one of the most popular Node.js frameworksthat runs on all the major operating systems. This framework has a static ecosystem for writing server-side web apps, and this way you can target your business needs and decide which package to use. It is the simplest framework and especially targets development. Express.js is the simplest, fastest, non-opinionated Node.js framework**. ** It is a simple technology which is built on Node.js and acts as middleware to manage the servers and routes. Node.js has an asynchronous nature and Express.js has the ability to develop light-weight apps that can process multiple requests seamlessly and depends on the capability of the express technology. Hapi.js is the best Node.js web framework that is utilized for developing application program interfaces. This framework has a strong plug-in system which helps developers to manage the whole development process. Hapi.js comes under the top Node.js frameworks for web application development and is loved by developers as they find it easy to work with and manage the whole script. Sails.js is yet another popular Node.js framework that is used to develop custom enterprise-grade Node.js applications. It has all the capability to build the best apps with the support that modern apps need. Sails.js consists of the APIs which are data-driven attached to a scalable service-oriented architecture. The team that created Express.js developed Koa.js. It has been developed for filling the gaps of Express.js. Koa has a unique script and methods that make it work on different browsers. It helps you to work without any callbacks and will provide you with a strong effort in error handling. LoopBack.js is yet another famous and well-used Node.js framework having an easy-to-use CLI and an API explorer which is dynamic in nature. It helps you create different models depending on your required schema (or even if there is no requirement of a schema). It has good compatibility with different REST services and different varieties of databases that cover MySQL, MongoDB, Oracle, Postgres and more. Derby.js provides seamless data synchronization between the server and the client. Derby.js is well-known as a full stack Node.js framework for writing modern web apps. It provides you an opportunity to add customized code and build highly efficient web apps. Derby.js is going to get massive exposure in 2019 as it has some great features. Total.js needs very little maintenance and gives a strong performance and a flawless scaling transition. 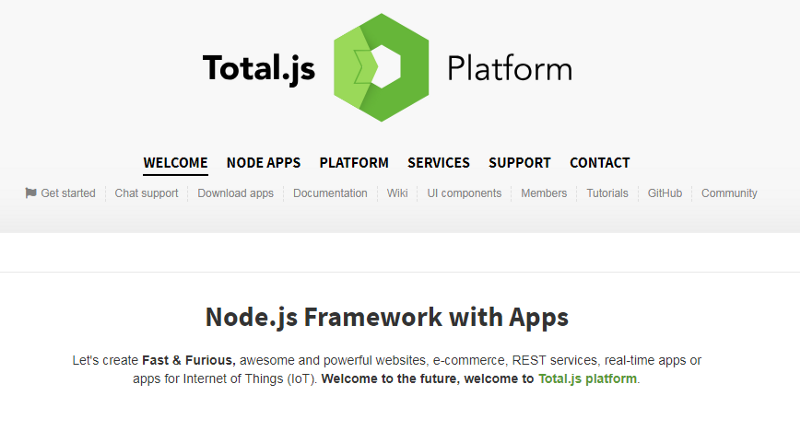 The whole team of Total.js is working hard to match user requirements and make it a lovable and highly usable Node.js framework worldwide. This indicates that the Total.js framework will likely get good exposure in the coming years. This can be a tough decision to make as there are so many Node.js frameworks in the market as we’ve seen here. But the decision solely depends on your project and business requirements. Different Node.js frameworks have different specialties ranging from speed, learning curve, coding structure, flexibility, configuration, and more. The pervasion of technology is getting greater in today’s digital world. This means that the level of competition between frameworks and different technologies is getting higher and higher. There are so many Node.js frameworks available in the market but you just need to choose the best one to meet your business’s demands. The features and functions of Node.js frameworks have all the capabilities to allow you to build a strong and error-free application for your enterprise. Choosing the best NodeJS frameworkis a tough task as it takes a lot of research and analysis to understand the details of each particular framework. It’s up to you to do that further research and select the framework that will help you develop top website applications.